This scholarly synthesis of biblical studies and Christian social ethics is designed to provide a biblical argument for intentional institutional change on behalf of social justice. 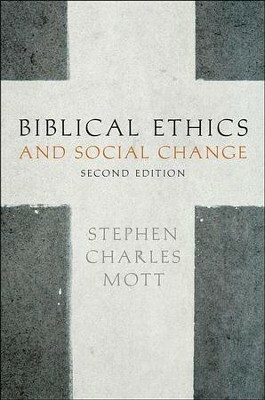 Stephen Charles Mott provides a biblical and ethical guide on ways to implement that change. The first part of the book, providing the biblical theology of intentional social change, deals with the central concepts in biblical and theological ethics: grace, evil, love, justice, and the Reign of God. Christian social change must be rooted not only in justice, but in the grace received through the death and resurrection of Christ. The second part evaluates ethical and theological methods for carrying out that intentional social change. It offers a study of evangelism, counter community, civil disobedience, armed revolution, and political reform. It shows the contribution of each as well as the strong limitations of each used in isolation. A recurring theme of the book is the scriptural insistence on the priority of justice as taking upon oneself the cause of the oppressed. Justice is understood on bringing back into the community those who are near to falling out of it. Political authority has a vital role in social change for justice. It is essential that a Christian use all available and legitimate means of meeting basic needs by providing for all what is essential for inclusion in society. In this revised edition, Mott updates the contemporary illustrations and includes his own further reflections in the last thirty years on this topic. Stephen Mott was Professor of Christian Social Ethics at Gordon-Conwell Theological Seminary for twenty-five years. I'm the author/artist and I want to review Biblical Ethics & Social Change.